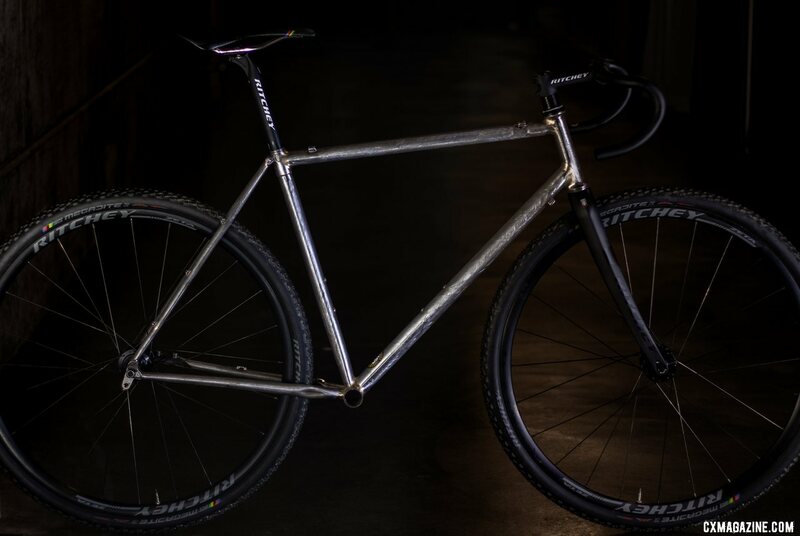 While we were racing around 2019 NAHBS, an unpainted, brazed frameset caught our eye. It ended up being the craftsmanship by none other than the legend Tom Ritchey. However, it wasn’t just a one-off show bike. The Ritchey Design founder brazed the frame to both celebrate the 25th anniversary of the Ritchey Swiss Cross and offer one of the nicest gifts of gratitude to another legend and former sponsored racer, Thomas Frischknecht. The frame we spotted was a Tom Ritchey-brazed version of the latest model coming out of the company, the steel Ritchey Swiss Cross 25th anniversary edition. Ritchey unveiled a new, updated version of the steel Swiss Cross frame this week. The steel cyclocross frameset gets a slew of updates but keeps the look and history of the Swiss Cross Canti and Swiss Cross Disc framesets and pairs it with the modern trappings, clearance and fork of the adventure-oriented Outback frameset. 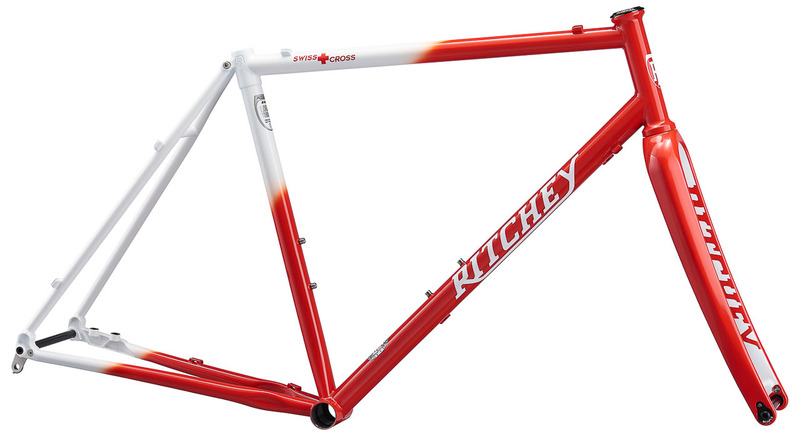 The new limited edition 25th anniversary Ritchey Swiss Cross frameset. Only 100 will be made, with just 30 coming to the U.S. The 25th anniversary Swiss Cross now features thru-axles and flat mount disc brakes of course, but also gets increased mud and tire clearance (and slightly longer chainstays), accommodating 40mm tires. The new limited edition 25th anniversary Ritchey Swiss Cross frameset. Flat mount and thru axles are two new features. While the frame shares some traits with the Outback, it’s still a race-oriented ride and leaves the bikepacking, racks and fenders to its more adventuresome sibling. The Swiss Cross also features a higher bottom bracket (average drop is 63mm), with the expectation that off-cambers and perhaps lower volume tires are in its future. Already lining up behind Frischi to get yours? If you fancy the iconic red and white version, you better act fast, as Ritchey is only producing 100 of the limited edition anniversary color and just 30 are heading to the U.S. There will be more, in the less-limited black and white color scheme. 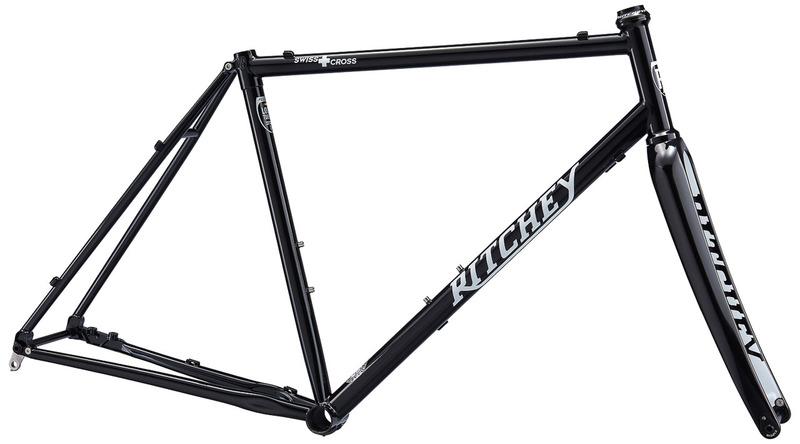 The new Ritchey Swiss Cross frameset also comes in a $1399 black edition that won’t be so limited in quantity. The limited edition red and white frameset is offered at presale for $1,499, and comes complete with a pair of Megabite tubeless tires and a Frischi bobblehead, while the black frameset retails for $1,399 without the accessories. Cyclocross Magazine got an exclusive first look, and fast-twitch fingers can take advantage of the pre-sale to lock up one of the limited edition red and white Swiss Cross framesets. Full details from Ritchey below the photo gallery. Possibly the most iconic frame associated with Ritchey, the Swiss Cross draws its name from early factory rider, CX and MTB XC legend Thomas Frischknecht. The first iteration of the Swiss Cross was a no holds barred race machine designed for one thing: ripping through dirt like no other. Captained to numerous victories under Frischi, the Swiss Cross went on to being one of the most revered frames of the Ritchey offering. Twenty-five years later, the Swiss Cross is still a staple of the Ritchey fleet, only now it’s received some modernization of 12mm thru-axles, flat-mount brakes and higher tire volume clearance. Yet one thing has remained unchanged- it is still a no holds barred race ready dirt ripper. Whether it’s leading the charge on bell lap, or ticking off the grueling miles of a gravel grinder, the new Swiss Cross is more than capable of tackling it all. In honor of its 25th anniversary and namesake, Ritchey has created 100 limited edition framesets, crafted after the frame Frischi rode to European Cyclocross Championships. 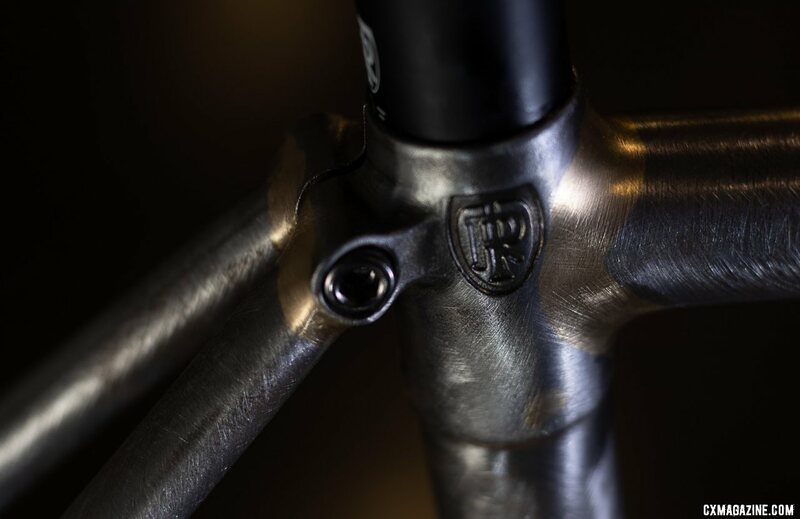 Only 30 of these frames will be offered in the US alone, each numbered for added uniqueness while delivering the same ride quality Ritchey frames are heralded for. As part of this special limited time pre-sale, all orders will receive along with the frameset, a Frischi bobblehead and set of WCS MegaBite tires. 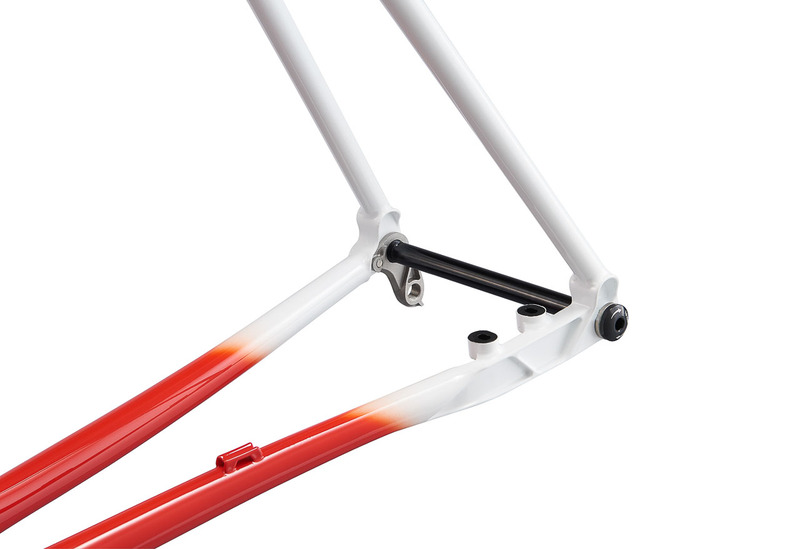 While both colors are available, ONLY the Anniversary Edition framesets will ship with a Frischi bobble and tires. Orders ship at the end of April. SunRace’s CXMX8 wide-range cassette is a lightweight option when you need extra gears for gravel riding. We swapped it in to see how it rides. We’re unearthing our photos of Team USA Cycling’s athletes at the UCI 2019 Cyclocross World Championships in Bogense. Here are images of the U23 Men.